Find out how qualified you are to be a professional senior caregiver. Take this quick quiz to find out if you have all the necessary training or if there are areas where you should seek more training. These are actual questions from the nursing assistant test administered by the department of health in each state. 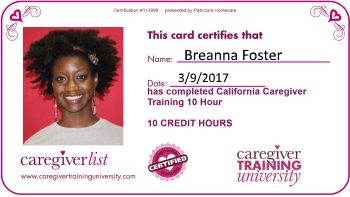 Caregiverlist's directory of certified nursing aide and certified home health aide and caregiver training schools provides the admission requirements and costs of schools in your area. Begin working as a non-medical companion caregiver or a certified nursing assistant or home health assistant for a senior care company in your area now.